No performers in Elmo costumes were harmed during the demo. Yesterday afternoon, I rode an autonomous shuttle down a short section of Broadway in the heart of Times Square, and it was easily the most boring part of my day. I'm not saying that because my life is particularly exciting, either. The trip was boring because everything inside the Coast Autonomous P-1 worked exactly the way it was supposed to: The shuttle crawled up to a barricade on 47th Street, paused for a bit, and scooted back in the opposite direction toward 48th. In this case, the vehicle wasn't completely autonomous -- Coast CTO Pierre Lefevre manually started each leg of a trip with an Xbox Elite controller -- but the P-1 navigated its surroundings all own its own. That short trip was one of many small-scale tests the company has put on over the years, all of which speak to the commercial viability of tiny, driverless buses. I can't imagine those tests were any more exciting. The P-1 isn't ready for roads just yet, but it's a fascinating taste of what the future of urban transit could look like: simple, straightforward and easy to accept. For a company like Coast, that's the best kind of boring. Coincidentally, the shuttle itself doesn't look like much, either. It's basically a big, self-enclosed golf cart with massive tinted windows. Since the shuttle scoots around bi-directionally, there's no discernable front or back -- it's the same all the way around. Meanwhile, a white ringlike bench hugs the interior walls, and a pair of roof-mounted grab rails sit directly across from a display for route information. Coast says up to 20 people can fit inside (assuming some people choose to stand) but I wouldn't want to ride one of these things with more than 10 or 12 people inside. There are no seatbelts, either, which works out just fine because each shuttle is meant to move between 15 to 20 mph at most. Those low speeds also help keep the shuttle's runtime as high as possible -- Lefevre says each one can run between 10 and 12 hours on a single charge, and that they charge on inductive panels the shuttles park on at the end of the day. Both ends of the P-1 are kitted out with LiDAR for object detection and collision avoidance, while two camera arrays ensure the vehicle can see stop lights and traffic signs. The shuttle doesn't map out its route on the fly, though: Before the first P-1 rolls out to pick up customers, a car with a roof-mounted sensor drives the route first, capturing crucial mapping data. Once that data is offloaded, it's processed for a few hours before the Coast team fleshes it out further with pick-up stops and other route-specific points of interest. 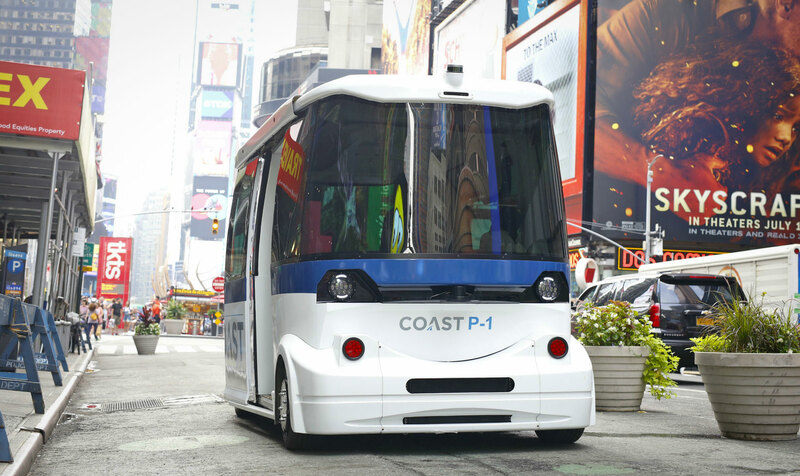 Coast's approach is pretty straightforward, but despite performing similar demos dozens of times, its decision to stick a driverless shuttle in the heart of New York City couldn't be more timely. The city's subway infrastructure is quite literally falling apart. Street traffic was always pretty nightmarish, but the rise of inexpensive ride-sharing services like Lyft and Uber mean more cars are clogging the streets. Could a fleet of autonomous shuttles like Coast's make traveling in New York City less of a hassle? Maybe, but don't count on it anytime soon. Right off the bat, the company's self-driving shuttles seem like a better fit for closed systems -- think sprawling office parks, airports, theme parks and school campuses. Aside from the occasional stray pedestrians, there's little to throw one of these shuttles for a loop. Coast adviser Rick Baker (who served for nearly 10 years as mayor of St. Petersburg, Florida) says the company is in talks with at least one of each. When it comes to deploying Coast in a city like New York, things get a little harder. For one, Coast isn't just going to sell these driverless shuttles to cities -- the company has to operate and maintain the fleet itself, a move that'll probably require lengthy contract negotiations with local governments. There's also the question of what paths these shuttles would use to navigate around New York. The city has had a grid of priority lanes for buses for decades, and it would make sense for shuttles to use those instead of driver-accessible lanes. That said, I'd be willing to bet that anyone who has ever driven in New York City has dipped into a bus lane for a few blocks, and someone cutting off a tiny driverless bus that doesn't have seatbelts might not end well. So, the odds of Coast coasting in and solving New York's gridlock problems are pretty slim. But that doesn't mean it won't find success in the other markets it's targeting, not to mention in small slices of cities where traffic flow and infrastructure could make Coast a viable option. Assuming the P-1 works as well on open roads as it did in this demo, this kind of autonomous short-haul commuting could easily start to feel, well, mundane. And as it happens, that's just the kind of boring the Coast team aspires to.